Easter provides Walt Disney World guests the opportunity to take part in a variety of fun activities, egg hunting and meet and greets. The Easter Bunnies meet at the Magic Kingdom next to City Hall daily through Easter Sunday, April 5. They meet together for photo ops and they do offer Photopass, but they do not sign autographs. Instead they offer a special pre-signed, egg-shaped collector card. Read this post for more information. On Easter Sunday a large number of junior Southern Belles will be available in the morning at the Magic Kingdom’s Town Square for photo ops. Easter Sunday offers a special Easter themed pre-parade at the Magic Kingdom. A few minutes before each Festival of Fantasy parade a variety of bunnies and other Easter themed characters will march down the parade route for the enjoyment of park guests. Each Easter season presents new delacately designed oversized chocolate egg creations at the Grand Floridian lobby. They are usually between 16 and 20 inches tall and are hand painted by Disney World chefs with amazing Disney movie designs. From March 27 through April 5, Epcot will offer it’s annual Egg-stravaganza. Guests are allowed to purchase a map and sticker set for $4.95 at the Heritage Manor in the American Adventure pavilion, Pin Central on the bridge from Future World to World Showcase, Port of Entry gift shops and the International Gateway gift shop. After hunting for the special eggs in each World Showcase Country, guests place the corresponding sticker on their map. After completing their egg hunt, they return the map, (complete or incomplete) for a special surprise gift for each map purchased. 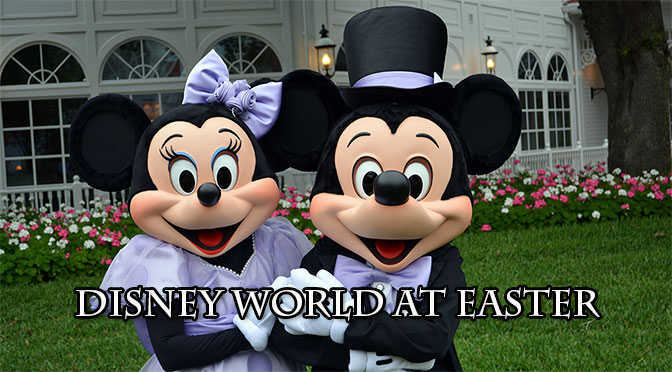 On Easter Sunday morning, a variety of Disney World resorts offer special character meet and greets. In 2014, we met visited the monorail resorts and met Mickey & Minnie, White Rabbit, Chip n Dale and the Easter Bunnies (separately at different resorts). The Grand Floridian offered free pastries and drinks in their grand courtyard in addition to the meet and greet. Each resort offered children the opportunity to gather candy-filled eggs for free. The children are separated by age group and gather eggs at the same time. We found that the Polynesian resort was the best as there were few guests. I’m sure there were more, but those were the ones that my friends or I met in recent years. Kenny do you know the time of the Easter egg hunt at the Polynesian? Staying at AOA so we would hop over to Polynesian for the hunt. I’m assuming we can go do that hunt even if we are not staying there? Hi Kenny~ IF WL doesn’t offer Easter morning events :( which resort would you suggest we go to for the best character interactions and fun kid activities? Keeping in mind crowds and that we are staying at WL and heading to Epcot later in day. Thanks for your tips!! I think I would like to go to the Contemporary Easter morning to try to meet the Easter Bunny, mostly because it’s something I haven’t done before. But can you tell me about how crowded you think it will be? I’m really not into waiting in a long line with a 2 and 6 year old to meet Characters. We are planning to go to the Animal Kingdom in the afternoon, I have fast passes starting around 1pm. Any 2017 info available? We will be in DW the week before Easter Sunday. Thanks! Any inside info on Easter activities for 2016? Any chance to meet Thumper at a meet and greet or character meal? Thanks for all the great info – wouldn’t trust anyone else! No, but the resort ones are like what you describe.